Last week, SKECHERS presented MBEF with $100,000, part of over $1million the company raised at its 2013 Friendship Walk. This donation marks an increase of nearly $30,000 over last year’s gift. The Friendship Walk was co-hosted by Jimmy Kimmel and drew over 900 Manhattan Beach walkers. 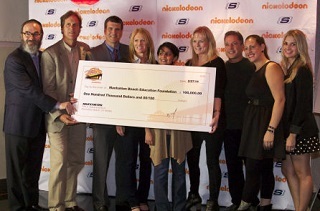 We thank SKECHERS for designating MBEF and five other education foundations as worthy recipients of the proceeds. Annual Appeal Does it Again! Thanks to our Volunteers. Thank you, parents and volunteers, for stepping up again for our students. All counted, MBEF’s Annual Appeal, which ended January 31st, raised a record $5.15 million for our students. Site representatives at each school worked tirelessly to educate parents about the impact their donations have in our children's classrooms. Parent donations last year paid for 70 educators in grades K-12. Thank you to our volunteer site rep teams for their time and energy. See a list of them here. 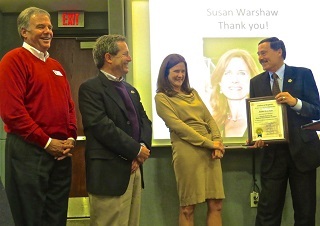 On Wednesday night, the MBUSD Board of Trustees honored MBEF’s outgoing Executive Director Susan Warshaw for her nine years of service to the Foundation. Susan started as the volunteer VP of Communications before serving seven years as its Executive Director. Several Board members, PTA Presidents and City Councilmen shared words of thanks for Susan’s dedication to our students and public schools. “We deeply appreciate all of Susan’s contributions to MBEF. She will be missed,” shared Nina Patel, President of MBEF. 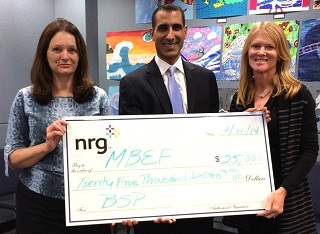 Recently, nrg El Segundo’s Ahmed Haque presented MBEF’s Director of Business and Community Development Margo Thole and Board Member Marija Kosanovich with a $25,000 donation. This gift more than doubled what nrg generously gave MBEF last year, its first year in the Business Sponsor Program. nrg El Segundo is a subsidiary of NRG Energy, a Fortune 500 company and pioneer in developing clean energy. Last year, the company was named to the “Civic 50”, an initiative to identify the 50 most community-minded companies in the nation by Bloomberg and Points of Light Foundation. Thank you nrg El Segundo for the increased support of our schools. Manhattan Wine Auction – June 14. Tickets go on sale at midnight, May 1. Last year tickets sold out in nine hours, so mark your calendar for both May 1 (when tickets go on sale) and June 14 when we will celebrate the 20th Annual Manhattan Wine Auction. Held at the Manhattan Country Club from 4:30-11, it's an opportunity to celebrate our schools while sampling the best of our local cuisine and wine from around the world. See more at www.manhattanwineauction.com. Having just closed the books on the most successful Annual Appeal to date, MBEF now shifts its focus to planning for next year. Throughout the spring, the MBEF Grants Committee led by Executive Board Member Michelle Cormack will meet with key stakeholders to decide what types of programs will help improve our schools. 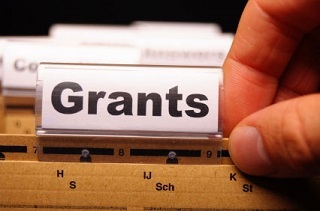 Fortunately, most of the grants we have awarded in the past will continue. One thing is certain: No teacher layoffs. Your ideas are welcome, so look for a parent survey soon. Contact us at communications@mbef.org. See what our grants paid for in the 2013-14 school year here.